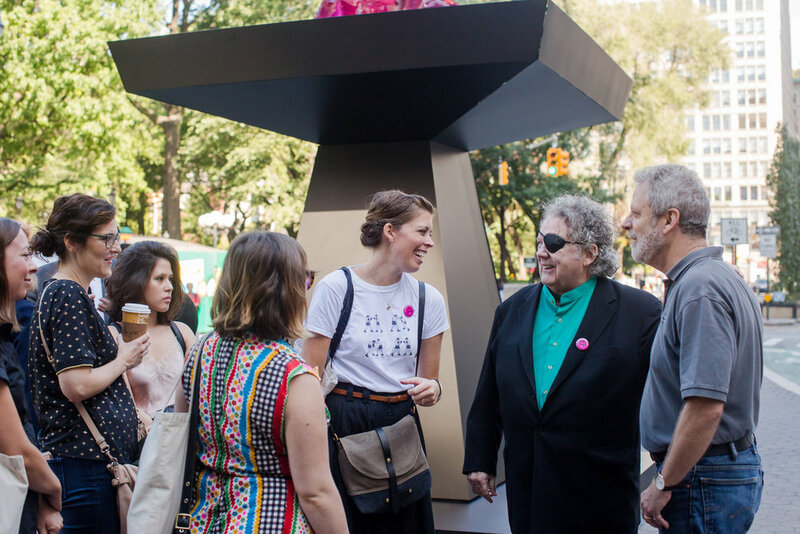 NYC Parks and the Union Square Partnership, in partnership with Marlborough Gallery welcomes Dale Chihuly’s eye-catching Rose Crystal Tower to Union Square Park. A part of the 50th anniversary of Parks’ public art program Art in the Parks, this piece will be on display through October 2018. The artist today joined Parks Manhattan Borough Commissioner William Castro, Executive Director of the Union Square Partnership Jennifer Falk, and representatives from the gallery on site to present this monumental sculpture. 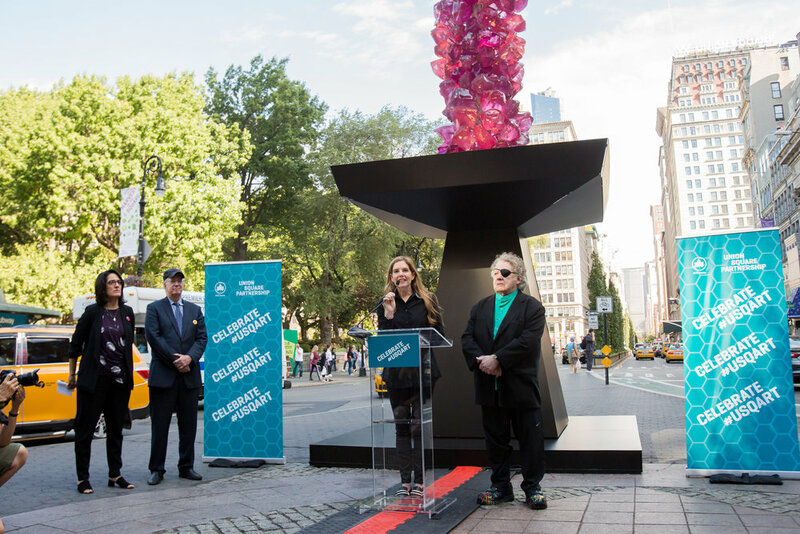 “Welcoming Dale Chihuly’s Rose Crystal Tower to the Union Square district is another wonderful example of the Union Square Partnership’s Art in the Park program,” said Jennifer E. Falk, Executive Director of the Union Square Partnership. “In conjunction with the NYC Parks, we are thrilled to collaborate with a wide range of art partners in order to bring incredible installations to Union Square, like the work of this world-renowned sculptor. 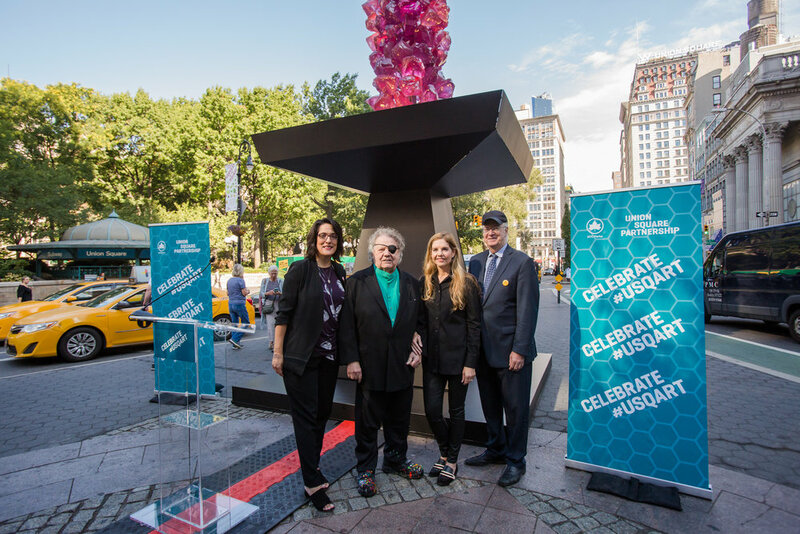 We are proud to showcase Mr. Chihuly and know that this exhibit will enhance the experience of all who visit Union Square in the coming months." The Rose Crystal Tower stands 31-feet tall and is composed of Polyvitro crystals and steel. Polyvitro is the artist’s term for a plastic material which he casts into individual chunks which resemble glass, but are lighter and more resilient. Chihuly used Polyvitro crystals in the artist’s landmark exhibition, Chihuly in the Light of Jerusalem 2000. Dale Chihuly is an American artist known for revolutionizing the Studio Glass movement and elevating the perception of the glass medium from the realm of craft to fine art. Over his 50-year career, the artist has become known for his iconic glass sculptures and ambitious architectural installations in historic cities, museums and gardens around the world. Chihuly utilizes a variety of media including glass, paint, charcoal, graphite, neon, ice, and Polyvitro to realize his creative vision. The artist’s work is included in more than 200 museum collections worldwide including the Metropolitan Museum of Art, the Smithsonian American Art Museum and the Corning Museum of Glass. Major exhibitions include Chihuly Over Venice (1995-96), Chihuly in the Light of Jerusalem (1999), de Young Museum in San Francisco (2008), the Museum of Fine Arts, Boston (2011), Virginia Museum of Fine Arts, Richmond (2012) and the Montreal Museum of Fine Arts, Montreal, Canada (2013.) Chihuly Garden and Glass opened at Seattle Center in 2012. An exhibition of new work at Marlborough Gallery in New York is planned for 2019. Photography by Liz Ligon for Union Square Partnership. NYC Parks Manhattan Borough Commissioner William Castro speaks to 50 years of art in parks. Union Square Partnership Executive Director welcomes the community and partners to the neighborhood. Dale Chihuly, sculptor, and Leslie Jackson Chihuly, CEO of Chihuly Studio, introduce the Rose Crystal Tower. 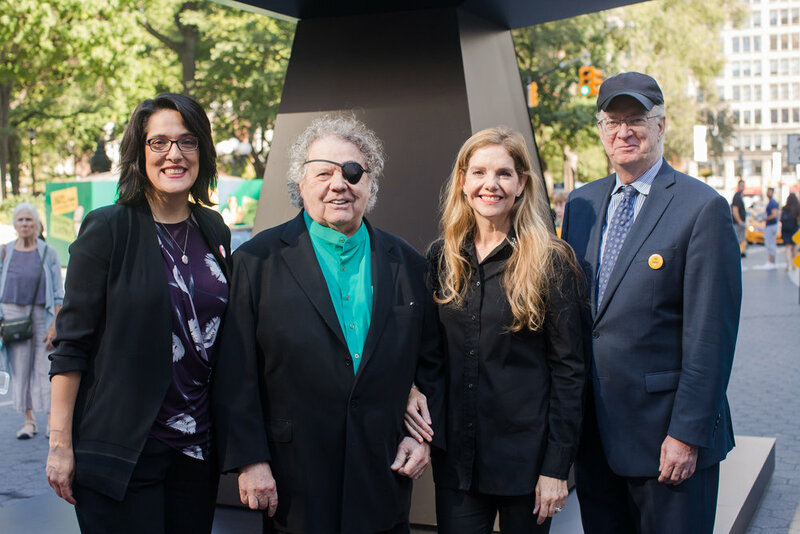 Union Square Partnership Executive Director Jennifer Falk, Dale Chihuly, Leslie Jackson Chihuly, NYC Parks Commissioner William Castro. Union Square Partnership Board of Directors join Commissioner Castro and Executive Director Jennifer Falk to celebrate Rose Crystal Tower Union Square. Chihuly Studio team in New York for the Rose Crystal Tower debut in Union Square.